Xenon Pharmaceuticals (XENE) is a clinical stage biopharmaceutical company focusing on discovering and developing innovative therapeutics for neurological disorders. XENE has an extensive knowledge of human genetics and diseases caused by mutations in ion channels, known as channelopathies, focusing their efforts on novel product pipeline of CNS-central nervous system therapies, to address areas of high unmet medical need, such as epilepsy, migraine and pain. Xenon pipeline includes XEN1101 (Kv7 channel opener) and XEN901 (selective Nav1.6 inhibitor) both for seizures/epilepsy. Earlier this year Xenon expanded its neurology pipeline by announcing a new product candidate, XEN007, for hemiplegic migraine (HM), beside the partnered drug with Genentech, the Nav 1.7 antagonists GDC0310 for pain, which still waiting for Genentech decision regarding the timing to enter Phase-2 clinical trial testing. Ezogabine (known as Potiga in the US and as Trobalt (Retigabine) in Europe) was originally developed by Valeant, licensed to GSK and approved in 2011 by FDA for treatment of adult focal seizures (also referred to as partial onset epilepsy). Although not foreseen as frontline therapy, it was considered an important addition for the anti-epileptic drug (AED) category, given its differentiated mechanism of action (MOA), for patients refractory to existing AEDs. The drug was predicted to have sales of $800M a year when launched but due predominantly to its side effect profile, never came close to achieving these types of sales figures. When the drug was launched it had some notable liabilities, including 3 times a day dosing and potential bladder retention issues. However, the real side effect issue that hurt the brand was not well known at the time of launch but developed over long term exposure to the drug – blue pigmentation, in the skin but more concerning in the eyes. The concern around pigmentation caused FDA to slap a black box warning on Potiga, stating that the pigmentation change in the retina could lead to vision loss. Although follow up studies performed by GSK indicated that pigmentation was likely just cosmetic, the damage to the brand had been done. In June 2017 GSK has announced that it was withdrawing the drug from all markets. What has been learned since the Potiga (ezogabine) launch and subsequent pigmentation debacle, is that the cause of this side effect is very likely dimerization. Given the initial enthusiasm and expectations around the Potiga launch, it would make sense that if a company could develop a next generation Kv7 potassium channel opener that didn’t dimerize and therefore didn’t cause pigmentation issues, there would be a good market opportunity available. On April 2017, Xenon acquired the worldwide development and commercialization rights to XEN1101 from 1st Order Pharmaceuticals. XEN1101 is a next-generation Kv7 potassium channel opener that preclinically has demonstrated improved pharmacokinetics, good selectivity, and improved pharmacology from a new chemical platform over the first-generation potassium channel modulators, such as Ezogabine.. Developed in the same lab at Valeant, but never licensed to GSK, XEN1101 was a second generation Kv7 drug developed to improve upon Ezogabine. Importantly Xenon has reported that XEN1101 cannot dimerize and therefore should not cause the blue pigmentation seen with long term use of Ezogabine. If XEN1101 proves to be a more potent and cleaner next generation Kv7 opener, then perhaps it can play the role that was originally envisioned for Ezogabine when it was approved in 2011 in the treatment of adult partial onset epilepsy. That market opportunity alone makes XEN1101 an attractive asset, but there is another part of the Ezogabine / 1101 story that has a more human element to it. Most of us know what epilepsy is, but not many are aware of the infants and toddlers linked to this tragic disorder with a mutation in the KCNQ2 gene. Infants with KCNQ2 epilepsy typically present with seizures in the first week of life. Seizures appear as stiffening of the body (tonic) often associated with jerking and changes in breathing or heart rate. The seizures are usually quite frequent (many per day) and often difficult to treat. Typically, the seizures are associated with abnormal brain wave patterns on EEG during this time. The seizures in KCNQ2E often resolve within months to years but children have some degree of developmental impairment involving one or more domains (motor, social, language, cognition). This can range from mild to severe depending on a number of different factors. Some children may also have autistic features. https://www.ncbi.nlm.nih.gov/pubmed/27602407 In the paper it was noted that earlier intervention with Potiga (Ezogabine) appeared to show the greatest benefit. GSK decision to withdraw the drug from the market pushed many angry families, who had been using the Ezogabine successfully off label for the infants with KCNQ2 epilepsy, to try and ask GSK to keep supplying Potiga for their babies under compassionate use. “All we’re asking for is compassionate use availability so we’re asking them to basically say we’re going to allow the kids who are on the drug to remain on the drug,” The mother said. Parents said, they plan to continue to fight for their son quality of life and remain proud of their little boy. After having heard that the company would not be making the drug available, family began to wean the kid off Potiga. His seizures started up right away, multiple times an hour. Parents were in despair. Without the ability to control his seizures, the doctors were sedating their son. The national attention helped few families to get GSK’s attention, they finally got word that the company would help them get access to the medicine, but they have no idea how long the commitment will last. Ever since Xenon acquired XEN1101 in 2017, the company has mentioned its interest in developing it for the KCNQ2 population. Then, over a month ago, back on June 21st the FDA database updated its orphan-drugs section the Ezogabine/Potiga Orphan-Drug-Designation (ODD) for the “Treatment of KCNQ2 epileptic encephalopathy” (Link to the FDA ODD) and the sponsor is Xenon Pharmaceuticals. This adds some real intrigue to the Xenon story, given its stated interest in developing XEN1101 for the same indication it just received ODD with Ezogabine. So, if XEN1101 is a better version of Potiga (Ezogabine), why does XENE appear interested in developing Potiga? The answer is likely related to optionality in their discussions with FDA and KCNQ2 development, the conversation with FDA around KCNQ2 development just got a lot more interesting after getting ODD for Potiga. XENE can now sit down with FDA and discuss two assets, Ezogabine and XEN1101, both of which mechanistically make sense to develop for KCNQ2 epilepsy. One asset, Ezogabine, comes with some known safety issues, but also with anecdotal evidence of its benefit in some infants with KCNQ2 epilepsy. The other asset, XEN1101, appears to have cleaner side effect profile, but has limited human exposures to date. Let’s also not forget that having this type of conversation with FDA is a lot easier than it was a few years ago. Today’s FDA has shown a certain flexibility when it comes to drugs in development for truly unmet medical needs. Furthermore, the influence patient advocacy groups play is increasing, and the KCNQ2 Cure Alliance is a well-organized and vocal (Link to KCNQ2 Cure). Sarepta (SRPT) is the first company that comes to mind, who took the DMD devastating disease with strong patient advocacy, to the next level of “patients come first” and fight for the right of the kids to get access to the only drug showing evidence of clinical benefit using the dystrophin as a surrogate endpoint. I am not suggesting Ezogabine is approvable drug yet at this stage, but with anecdotal evidence of efficacy and strong patient advocacy, would today’s FDA allow XENE to run a pivotal study? I believe with the new FDA under Scott Gottlieb, and the help of the KCNQ2 community and advocates, they will allow a Phase-3 trial in an infant population given the need and historical supporting evidence. The next question would be, what about GSK rights, as this niche is less meaningful to a giant company like GSK, but it is for XENE and most likely they will get into a tech transfer agreement with GSK and clear the path for the clinical study. So, if FDA were to allow XENE to enter a pivotal study in KCNQ2 with Ezogabine, their pipeline would suddenly have a Phase-3 asset on it, along with 3 other Phase-2 assets. The pipeline would be all CNS / ion-channel focused and would arguably be one of the deepest CNS pipelines out there. We have not heard any update from XENE regarding the KCNQ2 strategy, but regardless the ODD for Ezogabine certainly adds a little more intrigue into the story, and a renewed hope for the families to get back access to the drug that made their babies lives much better. On June 12th, Sage Therapeutics said the FDA has cleared it to expedite development of its drug to treat major depressive disorder and postpartum depression. Expedited SAGE-217 development plan to support potential NDA submission for MDD and PPD and previously completed placebo-controlled study in MDD considered as pivotal. The drug, SAGE-217, received breakthrough therapy designation in February. This development has readthrough to XENE, with its two epilepsy programs and one program for hemiplegic migraine (HM) that XENE are preparing to initiate the phase 2 study; all three programs have potential in rare-disease indications. The FDA commissioner Scott Gottlieb has pushed the FDA to review and approve drugs faster, the SAGE-2017 case is the best tell in case of CNS related disorders, we also remember well the day Sarepta got the FDA green light as well for its DMD drug Golodirsen Ex-53 rolling submission in an accelerated approval pathway. these cases might open the door for XENE to expedite its pipeline faster than we think, especially with the unmet need for pediatric indication with KCNQ2. 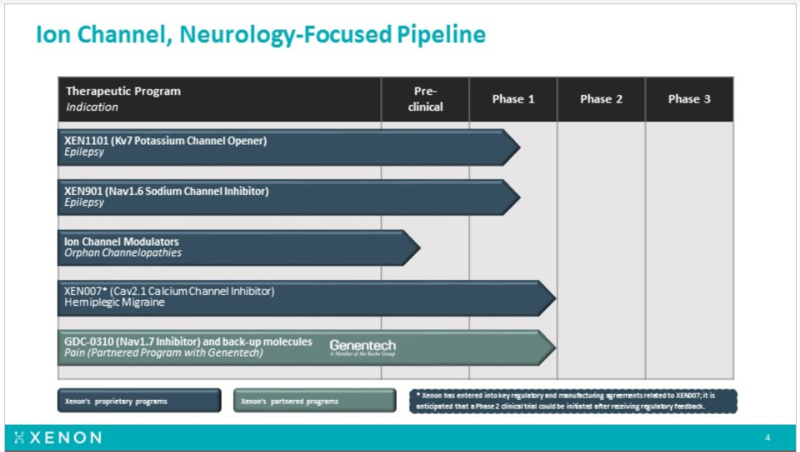 Moreover; XENE ‘s three neuro-based programs can become a candidate for accelerated approval pathway, where both XEN1101 and XEN901 are in early stage but were de-risked at EILAT conference back on May 15th, while the third program XEN007 was in-licensed recently and is Phase 2 ready. Back in October 2017, Xenon initiated a Phase-1 first-in-human clinical trial to evaluate the safety, tolerability and pharmacokinetics of both single ascending doses and multiple ascending doses of XEN1101 in healthy subjects. The XEN1101 Phase-1 clinical trial includes a PD read-out incorporating a TMS model, which is designed to demonstrate activity of XEN1101 in the central nervous system by observing a change in an EEG (electroencephalogram) or an EMG (electromyogram) signal. The results were exciting and were accepted as an oral presentation on May 15th at the 14th “Eilat”, an epilepsy focused conference held in Madrid, Spain. XEN1101 Pilot TMS-EEG Data Demonstrates Statistically Significant Effect of 20mg Dose versus Baseline (p<0.01) and Greater Effect on TMS-EMG Resting Motor Threshold at Significantly Lower Dose When Compared to Ezogabine. Phase-1 Pharmacokinetic Data Supports Potential for Once Daily Dosing. At Eilat conference, Xenon presented the first Ph-1a dose-escalation data for XEN1101 and preliminary preclinical/clinical data for XEN901. Despite the limited size and short duration of this data, the market reacted positively as these results provided a substantial de-risking of the program. The interim phase 1 for XEN1101 evaluated the tolerability, safety along with the pharmacokinetics of both single ascending doses (SAD) and multiple ascending doses (MAD) in healthy subjects, along with results from the completed Phase 1a pilot transcranial magnetic stimulation (TMS) study in 8 healthy subjects. The pilot TMS study was designed to assess XEN1101’s ability to inhibit cortical excitability, an important CNS effect observed with anti-epileptic drugs (AEDs). For those of you unfamiliar with the TMS model, a magnetic pulse is applied to the brain and one can monitor EEG brain waves or EMS thresholds such as the motor thresholds required to induce the muscle twitch typically measured in the hand. The amount of voltage required to induce that twitch is measured along with whether the addition of a drug can increase that versus baseline or versus placebo. The study has 5 cohorts of SAD (5, 15, 20 and 30 mg) including n=28 with placebo=6 and 1 MAD (15 mg) cohort (n=6, placebo=2) in healthy subjects treated for 7 days. Majority if AEs were mid and resolved spontaneously, most common AEs were headache, dizziness and drowsiness, one sever AE was vasovagal reaction following a blood draw and standing. SAD data demonstrated a dose-proportional increase in exposure with an extended half-life consistent with once-daily dosing (QD) versus Ezogabine that was three times daily dose (TID). PK data confirms a half-life consistent with once daily dosing and XEN1101 was shown to be overall safe and well tolerated. . Ultrasonography characterization of XEN1101-treated patient bladders did not reveal any urinary-related adverse events, further demonstrating the selectivity of XEN1101 for potassium channels within the CNS. So, basically the XEN1101 (Kv7) safety and PK looked good and superior to Ezogabine so far. XEN1101 does not dimerize,is more selective for the CNS target, and PK is tracking better than Ezogabine with the potential of once-daily dosing versus the uncomforted three-times daily dosing (TID) with Ezogabine. Also, a meaningful effect was observed at much lower doses of XEN1101 seen with 20mg versus 400mg Ezogabine. Initial MAD data from a single XEN1101 cohort (15mg once daily, n=6) in fasted patients, also showed steady-state plasma levels are achieved after approximately 7 days dosing. For 8 of the XEN1101 subjects, a pilot phase 1a TMS study was done to assess XEN1101’s ability to inhibit cortical excitability. The pilot TMS-EMG data demonstrated a dose-proportional increase in resting motor threshold (RMT) – with the 20mg XEN1101 dose achieving an approximate 2x increase in RMT relative to historical single-dose (400mg) ezogabine data (4.33% vs. 2.4%). TMS-EEG data for the 20mg XEN1101 dose also demonstrated a magnitude of amplitude change which is consistent with what is achieved with other standard of-care anti-epileptic drugs, and these changes were statistically significant (vs. baseline) at 4 hours post-dosing and observed broadly across the cortex region of the brain. XEN901, a potent, highly selective NaV1.6 sodium channel inhibitor, for the treatment of epilepsy, including treatment resistant adult and pediatric focal seizures, as well as rare, pediatric forms of epilepsy, such as EIEE13, an early infantile epileptic encephalopathy associated with gain-of-function mutations in the SCN8A gene, which encodes the NaV1.6 sodium channel. By selectively targeting NaV1.6, it is anticipated that XEN901 may achieve efficacy conferred by this well-validated epilepsy target, but with a potentially improved therapeutic index compared with currently available non-selective sodium channel inhibitors. There is strong human genetic validation supporting the rationale for treating epilepsy by blocking the NaV1.6 sodium channel. Nav1.6 is the most highly expressed sodium channel in the excitatory pathways in the CNS. When mutations in the SCN8A gene result in a gain of function in the NaV1.6 sodium channel, children can present with a very severe form of epilepsy. This early infantile epileptic encephalopathy is known as EIEE13. XENE have examined XEN901 in a pre-clinical model of genetically defined epilepsy as well as models representative of focal seizures. These studies showed that XEN901 is efficacious against seizures in both an SCN8A (NaV1.6) gain-of-function model, which is designed to be predictive of the pediatric genetic epilepsy EIEE13, and in the maximal electroshock seizure, or MES, model, which is designed to be predictive of adult focal seizures. When compared to phenytoin in both the SCN8A and MES models, XEN901 achieved the same degree of efficacy as phenytoin at one-thousand-fold lower brain exposures. XEN901 also was observed to have an improved therapeutic index relative to phenytoin as assessed by tests of rodent behavior and motor impairment. In February 2018, following acceptance of CTA for XEN901 by the MHRA in the United Kingdom, XENE initiated a randomized, double-blind, placebo-controlled Phase 1 clinical trial to evaluate XEN901’s safety, tolerability and pharmacokinetics in both SAD and MAD cohorts of approximately 64 healthy subjects in total. Upon completion of the Phase 1 clinical trial, a read-out of results is anticipated in the second half of 2018, followed by a Phase 2 trial evaluating XEN901’s efficacy as a treatment for adult focal seizures. XEN also intend to pursue a parallel plan to advance XEN901 into rare, pediatric forms of epilepsy as soon as possible. XENE is expecting final XEN1101 phase 1 and cross-over Phase 1b TMS data late this summer., We are waiting for more clarity regarding the Phase 2 clinical trial plans for XEN1101 which is aimed to be initiated by end of year 2018. Pediatric development options, after meeting the FDA to discuss the study pathway with either Ezogabine or XEN1101 in KCNQ2 population. From other programs, expecting XEN901 final phase 1 data and filing NDA for phase 2 in adults in 2H2018. Also looking for a clarity regarding the start time in XEN0007 phase 2. XENE reported cash and short-term investment balance as of March 31, 2018 of $35.1 million. On July 3rd, the company filed an 8-k disclosing it had sold 3.44 million common shares for net proceeds of $29.2 million through its previously announced at-the-market (ATM) agreement with Stifel. On July 03rd Adage Capital Partners, L.P. filed 13G showing 5.64% ownership in XENE. On July 12th, XENE entered into another ATM agreement with Jefferies and Stifel, effective as of July 11, 2018, under which Xenon may sell its common shares, from time to time, for up to $50.0 million in aggregate proceeds. On July 13thanother biotech oriented and deep science fund, Vivo Opportunity, LLC (a $1.8B healthcare fund based in San-Francisco) filed a 13G disclosing it owned an aggregate of 1,048,333 XENE shares or 5.6% of the company. Based on the trading around the ATM 8-k and Vivo’s 13G, we assume they purchased their stock via the ATM at a price of $9.50. The last two 13G filings show the interest by healthcare funds in XENE and its CNS pipeline, despite the huge run from the low of $2.1 back on November 2017 to reach the high of $11 (around 423%) with no meaningful correction. As the 06/30 13Fs start rolling in over the coming days, it will be interesting to see if other smart money funds have started a position in XENE. It is worth noting that Capital World, Biotech Value Fund, Orbimed, Nexthera and other smart money funds already owned XENE prior to the recent 13G filings of Adage and Vivo. If we add both ATM offerings, net cash around $39.5M to the $35.1M cash by end of Q1, XENE will have around $74.6M in total cash (will get the exact amount on 08/07 at the Q2 earnings call). The ATM sales reduce any financing risk in the near future and let the management concentrate on developing the company’s pipeline and advancing the clinical trials. Xenon with market-cap around $167 million, 17.66 million outstanding shares and only 11.76 million float with over 61.8% held by institutions and 12.41% held by insiders, leaves a very low share count, which might explain the sharp moves we saw in the share price during the year. We expect a large volatility in the share price following any important news, as the demand will be much higher than what the current shareholders are willing to sell, and usually cause a sharp spike in the share price. A quick look at the year to date XENE’s chart, can tell the whole story, company that found the right asset to fit their own expertise, stabilized at the bottom around $2-$3 and started a new run up without looking back. 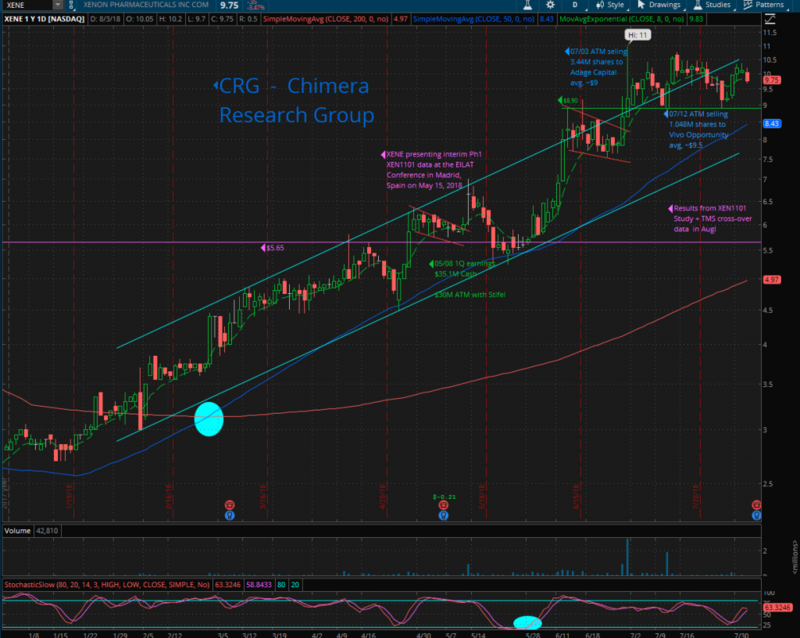 The price was trading within an uptrend channel since the beginning of the year, breaking out an old resistance line around $5.65, retesting it and bounced back to run again upward. On 06/29 the price broke out the uptrend channel’s upper line on large volume, and since then started trading side-way around the channel’s line, retesting the $8.90 line twice and bounced again to give the hint that at this level, the bulls are stepping in and take the control again from the bears, but the low volume show us mainly a low float & less investors who are willing to sell their shares at this level despite the huge run. XENE started trading within a predefined horizontal channel in the past 6 weeks, between the support lines $8.90 to the upper resistance line at the 52-weeks high of $11.0, while the Bollinger Bands are getting tighter and closer to each other. This creates a Volatility Squeeze condition within the bands, combined with decreasing volume to confirm the consolidation mode. This side-way movement can last potentially for a few days or weeks, usually followed by a volatile move and breakout of the upper or lower Bollinger Band, creating a fast and long move. Breaking out the 52-weeks high at $11 will push the price fast towards the next target, around $14.03 the weekly resistance line back from Feb 2015, followed by the next resistance line at $20.81, while the all-time-high is $23.50 from Jan 2015. I expect a quick move if the FDA gives XENE the green light to step up and enter a pediatric pivotal study in KCNQ2 with Ezogabine or XEN1101, which can be used as a registration study and their pipeline would suddenly have a Phase-3 asset on it, along with 3 other Phase-2 assets, and frankly add a tremendous value to the Xenon’s valuation. On the flip side, if the price breakdown the $8.90 line, the next support would be the 50-Day MA around $8.43 followed by the uptrend channel’s lower line around $7.95. Disclosure: The author has a long position in XENE and SRPT.